I mentioned in Monday's post that I would limit my junk bond buying to just one per month for the next three months. In today's post, I discuss two purchases made last Monday. Technically, those purchases were made in August and were not subject to the foregoing restriction which comes into play on 9/1. Bank of America announced on Monday that it was selling 1/2 of its stake in China Construction Bank to unnamed buyers for $8.3 billion, providing it with more of an equity capital cushion. This will provide the bank with $3.5 billion in Tier 1 Common Capital under Basel I. The after tax gain on this transaction is approximately $3.3 billion. SEC Filed Press Release I own BAC's common, equity preferred floaters originally issued by Merrill Lynch, "principal protected" senior notes issued by BAC and Merrill whose coupon is linked to a performance of an index, and trust preferred stocks originally issued by Delaware Trusts associated with Countrywide (CPP, a TC) and MBNA (KRBPRE and KRBPRD). Consumer confidence went way down in August, falling to 44.5 from the 59.2 reading in July. That was one bad number. The Case Shiller price home price index increased 3.6% in the second quarter, after falling 4.1% in the first quarter of 2011. However, the national index for home prices declined 5.9% since the second quarter of 2010 and are now at 2003 price levels. The index for the 20 metropolitan areas shows a 4.5% year-over-year decline. The largest one year decline is in Minneapolis at -10.8, then Portland at -9.6 and Phoenix at -9.3%. None of the 20 metropolitan areas showed an increase in price year-over-year. I noticed that this Senior Subordinated bond was available for purchase last Monday in a small 1 bond lot, so I picked it up instead. 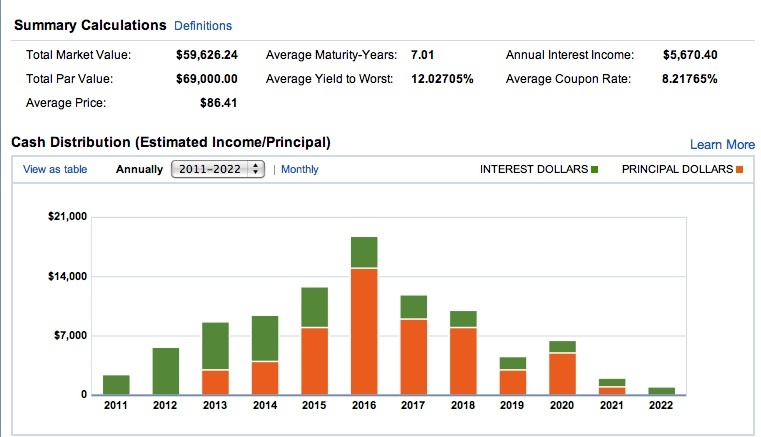 According to FINRA, this subordinated bond is currently rated at B3 by Moody's and B by S & P. A more senior bond, maturing in 2016, is rated slightly higher at Ba3 by Moody's. For Terex, there is a more senior unsecured bond issue in the original principal amount of $300 million. That bond matures on 6/1/2016 and is rated Ba3 (still junk) by Moody's. That more senior bond is selling over its par value. FINRA I believe Terex drew down on a secured credit facility to finance the recent share purchase of Demag Cranes AG, spending approximately €779 million in cash. SEC Form 8k So, there is a lot of debt more senior in priority than the subordinated 2017 "senior" bond that I purchased on Monday. In the capital structure, a better name for a senior subordinated bond would be junior bond. There will generally be more senior unsecured and secured debt, and no bond more junior than the "senior subordinated" bond. This is a link to the last quarterly report: TEX-6.30.11-10Q Long term debt is discussed beginning at page 22. This is a link to the prospectus: www.sec.gov Interest is paid semi-annually in May and November. My confirmation states that the current yield at my cost is 8.184% and the YTM is 8.470%. 2. BOUGHT 1 United Rentals 8.375% Senior Subordinated Bond Maturing on 9/15/2020 at 91.5 Last Monday (Junk Bond Ladder Strategy) (see Disclaimer): United Rentals (URI) is a publicly traded company that engages in equipment rentals in 531 locations. Profile | Reuters.com Like Terex, I would expect that the results will improve with a more healthy economy than now. The current consensus E.P.S. estimate is for $1.39 in 2011 and $2.47 in 2012. Analysts If the U.S. has entered or is about to enter a recession, those estimates will likely prove to be too high. According to FINRA, this subordinated bond is ranked Caa1 by Moody's and CCC+ by S & P. Fitch has it at a "B". This is a link to the prospectus: www.sec.gov Interest is paid semi-annually in March and September. This is a link to URI's last filed Form 10-Q. The debt is discussed in 6 starting at page 14. The company is highly leveraged. My confirmation states that the current yield at my cost is 9.074% and the YTM is 9.670%. 3. Bought Back 50 CBLPRC at 24.36 on Monday (see Disclaimer): CBLPRC is a cumulative equity preferred stock issued by the REIT CBL Properties (CBL). I have a lot of respect for the downside risks of REIT preferred stocks. REIT CUMULATIVE PREFERRED LINKS IN ONE POST/Advantages & disadvantages When this type of security is selling near its $25 par value, there is no or insignificant upside potential and the downside risk can be huge, as shown by their price action during the Near Depression period. I bought this same security at near $10 (October 2008: Buy CBLPRC). While I have successfully traded it, I will not be a long term holder of the shares purchased last Monday. Instead, I will flip them for whatever profit can be realized on the shares after collecting one or more dividends. Bought 50 CBLPRC at 21.87 SOLD CBLPRC at 24.25 Bought 100 CBLPRC @ 24.36 Sold: 50 CBLPRC at 25.36 My largest percentage gain was on the purchase of the common shares at $3.7 LATE DAY TRADES: GCI, CBL, FR, SLG, NYT, NWSA (Nov. 2008 Post), later sold @ 18.04 (November 2010). CBL owns retail malls and "open-air" centers, including several large malls in middle Tennessee. This preferred stock pays cumulative dividends at a 7.75% coupon on a $25 par value. There is a stopper provision found at page S-11 of the prospectus: Preliminary Prospectus Supplement CBL is paying a common stock dividend. The yield at a total cost of $24.36 is around 7.95%. This is a link to the firm's website: CBL & Associates Properties, Inc. This is a link to its last filed Form 10-Q. I have had concerns about SLM since I started to purchase these notes back in late 2008, when OSM was trading near $10. Last Monday, ISM was trading around 40 cents per share cheaper than OSM, even though ISM has a slightly higher spread over CPI. This may be due to nothing more than the light trading in these securities or it may be a discount applied to ISM due to its longer maturity. SLM Corp. CPI-Linked Medium Term Notes Series A 2017 (OSM) closed Monday, 8/29/11, at $21.01. SLM Corp. CPI-Linked Medium Term Notes Series A 2018 (ISM) closed at $20.62, which would give it a higher yield than OSM based on price and the slightly higher spread. I have bought and sold both notes. I currently own just 100 of OSM of with an average cost of less than $16 per share. There are 31 days in both the September and November pay periods. There will be 30 days in the October monthly period since September only has 30 days. The multiplier for October would be 30/365. Since the percentage increase in inflation is increasing, the penny rate goes up from September to the November pay period. A major concern about SLM is that the government has ended the FFELP program. So that student loan is just gone, at least until the Congress changes its mind, if ever. SLM is continuing to issue private student loans, but those loans no longer have the government guarantees. I did review a recent Credit Suisse report, dated 8/25/11, that claimed the current low interest rate environment is benefiting SLM, at least when the floor interest rate on the FFELP loans is higher than the prevailing interest rate. The CS analyst believes that spread adds $3 in value to the stock, along with $9 in value from the portfolio cash flows from the huge amount of FFELP loans on the balance sheet. That report is available to Charles Schwab customers. The general idea is to break-even on the bonds, recognizing that some defaults are inevitable. Hopefully, when most of these bonds mature in the 2014 to 2017 time frame, I will be able to deploy the proceeds into purchases of investment grade corporates, constructing a similar ladder, with much higher yields than prevailing today. I had two more trades on Monday and I will discuss only one of those in the next post. The other one was the repurchase of a double short at the close last Monday, a rule violation by our LB. Double short stock ETFs are only to be purchased when the VIX falls below 20 in an Unstable VIX Pattern. The ^VIX did fall 9.27% on Monday, but closed at 32.29. OG noted that he was not allowed to violate any of LB's stinking rules. RB added that it was going to violate all of those stinking LB rules as soon as it became Head Trader. LB disagreed with the assertion that it violated any Rule, such a claim is frivolous on its face. While LB does not wish to engage in an extended discussion with Nitwits, a recent modification to the trading rules for the Unstable VIX Pattern, #3,928,302,454,842 (A)(1)(b)(iii), allowed for such a trade under the current circumstances. In his NYT column discussing the rampant idiocy at Hewlett Packard (own common), James Stewart quotes a former Hewlett Packard director who said he "didn't know there was such a thing as corporate suicide" but now HP is showing the world that there is. It is impossible to read Stewart's column or many similar ones and comprehend why anyone would hire Apotheker to do anything requiring judgment. Another recent article highlighting the dysfunction at HP can be found at the WSJ. The Barrons' interview with Steven Romick, manager of the FPA Crescent Fund (FPACX), is worth a read. I would agree with his opinion about large caps. I currently own Microsoft and Wal-Mart which he mentions. His fund has a lot of cash and is rated five stars by Morningstar. This is a link to that fund's last SEC filed annual report: www.sec.gov This fund will short stocks, with a list found at page 21. I do not agree with most of those. The Commerce Department reported yesterday that personal consumption expenditures rose .8% in July, while personal income and disposable personal income increased .3%. Real disposable income decreased .1%. The personal consumption price index rose .4% and .2% excluding food and energy. Personal savings as a percent of disposable personal income was 5% in July, down from 5.5% in June. News Release: Personal Income and Outlays, June 2011 All of the inflation numbers are worrisome, but the FED keeps saying that the bulge is just temporary. A chart of the historical savings rate can be found at Personal Saving Rate (PSAVERT) - FRED - St. Louis Fed Generally, the savings rate fluctuated mostly between 7.5% to 10% between 1959 to 1985. During the Age of Leverage, the savings rate plummeted, falling into a range mostly between 2.5% to 5% during the past two decades. (monthly data since 1959 research.stlouisfed) The last monthly reading over 7.5% was in December 1993 at 7.8%. The rate has not been consistently over 7.5% since 1986. I date the start of the Age of Leverage, for both the U.S. government and the U.S. consumer as the mid-1980s. What Will Produce Growth after the Age of Leverage? (September 2009 Post) Prior to Reagan's presidency, the entire debt of the U.S., accumulated since the founding of the nation, was 909 billion dollars. United States public debt The deficits now are running at over a trillion a year. 1. Richard Lehmann's Recommendation of Floaters-OSM, AEB and GSPRA: In his Forbes' column, Richard Lehmann recommends three floaters that I own. They are GSPRA, OSM and AEB. I would not agree with his assertion that the "inflation protection is free". For example, the Aegon hybrid AEB pays the greater of 4% or .875% above the 3 month LIBOR rate on a $25 par value. The current yield at the 4% minimum is around 5.4% at a total cost of $18.5 per share. Aegon also has several fixed rate coupon hybrids, with the same basic terms as AEB except for the coupon rate. AEF, for example has a 7.25% coupon on a $25 par value and would have a current yield of 7.58% at a total cost of $23.9 per share. So, I could buy a similar security from the same issuer, at the same level of priority, and receive about 2.18% more in current yield. That is what I am in effect paying for the imperfect inflation protection of AEB. The inflation protection for AEB is imperfect since the tie to inflation is indirect. Normally, the short term rates would float up with rising inflation but that is not the case now due to the Fed's Jihad against the Saving Class. With CPI running at over a 3% annual rate now, you would not expect to see the Fed holding the federal funds rate at zero. So, the float is not working now due to the intervention by the Fed. GSPRA is also owned, but it suffers from the same problem as AEB. GSPRA pays the greater of 3.75% or .75% above the 3 month LIBOR rate on a $25 par value. Unlike AEB, GSPRA pays non-cumulative qualified dividends. Advantages and Disadvantages of Equity Preferred Floating Rate Securities I will generally prefer the Synthetic Floaters GYB and PYT, based on price and yield, and their higher priority to the GS equity preferred non-cumulative floaters. Importantly, GSPRA and AEB have no maturity date, whereas both GYB and PYT mature in 2034 at $25. And GYB and PYT have a .85% float over 3 month LIBOR, though with a lower minimum. But, it is important to calculate the yield at your cost. Analysis of Prior Question about Goldman Sach's Floaters (October 2009 Post). I am very light on GS bonds and preferred stocks now due to the headline risk. I bought one of the floaters referenced above on Monday which I will discuss in an upcoming post. I am not interested in PFK at its current price. This is a typical bank TP. Distributions are cumulative. In the event an interest payment is deferred, the deferred payment will accrue interest at the coupon rate. Deferral of interest payments can legally be made for up to five years provided non-activation of the stopper clause. The stopper clause is typical. (see page 34 of the Prospectus). It is activated by the payment on a junior security which would include common stock and equity preferred stock. STL does not have any equity preferred stock but is paying a dividend on its common stock. STL did participate in TARP but has redeemed the government's cumulative equity preferred stock last April. (page 29: www.sec.gov) Any equity preferred stock is junior in priority to the STL junior bond owned by Sterling Bancorp Trust I. The underlying bond is callable now by STL. Sterling will be able to continue using this TP as part of its TIER 1 capital which has certain advantages. The bank can treat a bond as equity capital for regulatory purposes and deduct the interest payments made to the trust for the benefit of the TP owners. Under financial reform, banks with more than 15 billion in assets as of 12/31/2009 will have to phase out the use of their TPs as equity capital. I have also taken some profits on the TP: Bought 50 of the TP STLPRA at $8.99 (November 2009); Added 50 STLPRA @ 8.69 (December 2009); Sold 50 STLPRA at $9.4 (December 2009); Bought 100 STLPRA at 8.87 (January 2010); Sold 100 of the TP STLPRA at 10.25 (February 2010); Sold 100 STLPRA at 10.47 (June 2010). I do not view that a purchase at or near par value as having much upside potential, a run toward $10.5 will usually provoke me to pare the position some. All bank TPs have the potential to become worthless in the event of an FDIC seizure. Regular Preferred and Trust Preferred (January 2009 Post). Most of my shares are held in the ROTH IRA. When held in that type of account for a U.S. taxpayer, I view this kind of security as in effect a tax free bond, since the interest is not taxed when received or distributed to me, which is likely to be never, assuming of course no change in the current laws governing this type of IRA. With a $7 brokerage commission paid in a satellite taxable account where this purchase was made, my current yield and YTM are both slightly more than the coupon of 8.375%. The current consensus estimate is for an E.P.S. of 51 cents in 2011 and 76 cents in 2012. Sterling Bancorp Trust I 8.375% closed at $10.13 in trading yesterday, up 11 cents. 3. Sold 300 WIN at 12.31 Yesterday (See disclaimer): When I bought 3 Windstream senior bonds, I mentioned that I would be selling the common stock and just go with the bonds.Bought 2 Windstream 7% Senior Bonds Maturing on 3/15/2019 Bought 1 Windstream 7.75% Senior Bond Maturing 10/15/2020 The WIN common dividend does have a slightly higher yield, and the dividends are taxed at the qualified dividend rate. The common dividend, of course, can be reduced or even eliminated which is not an option for the senior bond. Most of my profit from the common shares originates from a 50 share purchase made at $6.36, and my last purchase was earlier this month at $12. I am content with having received the dividend without losing anything on the shares, and my profit on the shares was close to $200. Windstream closed at $12.34 yesterday, up 2.32% for the day. I had a number of other trades on Monday that I will discuss in the upcoming posts. I had one other trade last week, made in the ROTH IRA, where I bought just 40 shares of CWH (see Disclaimer), a REIT, at $19.86, giving me about a 10% yield at that price. CommonWealth REIT, CWH This stock rose 91 cents in trading yesterday to close at $20.76. I have nothing to add to my recent prior discussion of that company. Added 30 CWH at 24.08 (July 15, 2011 Post). This is a link to the last filed SEC Form 10-Q. While I am continuing to add to my junk bond ladder in small amounts, I am going to cut back new adds to just one bond per month for the next three months. I want to see some positive economic news, and do not anticipate a good jobs report this Friday. Second quarter U.S. GDP was revised to 1%, though the composition of that anemic number improved some from the last report. Consumer spending increased .4% compared to a .1% gain in the previous estimate. The reduced estimate was mostly caused by weak exports and a smaller increase in inventories. The prior estimate was 1.3%. News Release: Gross Domestic Product and Corporate Profits The price index for domestic purchases increased 3.3% in the second quarter. Excluding energy and food, the price index for those purchases still increased 2.6%, up from 2.4% in the first quarter. The overall price index increased by 3.2%. Bernanke's speech was a non-event. Bernanke, The Near- and Longer-Term Prospects for the U.S. Economy--August 26, 2011 WSJ.com He did blame Congress for some of the current weakness. NYT He clearly placed the ball with Congress, mentioning "fiscal" 15 more times than "monetary". 1. Bought 100 of WLFCP at $10.32 and Sold 30 USBPRH at $21.84 last Thursday (see Disclaimer): WLFCP is a cumulative equity preferred stock that pays qualified dividends on a monthly basis. The coupon is 9% on a $10 par value. The issuer is a publicly traded company called Willis Lease Finance Corporation (WLFC), which is involved in the leasing of jet engines. The monthly dividend of $.075 per share was recently declared by Willis Lease. Willis Lease recently reported net income of $2.7 million or 31 cents per share for the 2nd quarter of 2011. I have bought and sold this issue, with the last two sales occurring earlier this year. My realized gains so far this year are $202.09 plus the dividends. (see snapshot at Item 2 Sold 100 WLFCP at $11.35). In addition to that linked post I have discussed this security in the following posts: Sold 100 of the 200 WLFCP (March 2011); Bought 100 WLFCP at 10.1 (January 2010 Post); Bought 100 WLFCP @ 10.33 (November 2010 Post). I may add another 100 in the event this security falls close to its par value. This is a link to the last filed SEC Form 10-Q. When investing in this type of security, it is important to also examine the firm's debt, which is of course more senior to this equity preferred stock. Willis has a lot of debt. (see pages 17-19 of 10-Q). This company has two publicly traded senior secured notes maturing on 11/1/2014. The other one has a higher coupon but is junior in priority to the one that I bought last Friday. The prospectus for both notes can be found at Prospectus dated August 16, 2010. The description of the two notes starts at page 163. The difference in priority would come into play in the event of a bankruptcy filing as explained in great detail starting at page 179. This is a link to its 2010 Form 10-K. Th debt is discussed starting at page 83. I bought what is called the Series A bond, the more senior one in priority. This is a link to the FINRA Information on that bond: FINRA According to FINRA, that bond is rated currently at Ba3 by Moody's and BB+ by S & P.
My confirmation states that the current yield at my cost is 11.315% and the YTM is 11.458%. I paid the seller $37.50 in accrued interest. 3. 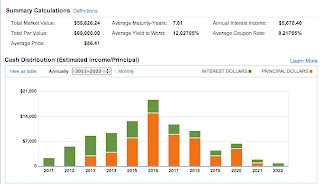 Exchange Traded Bond PFK (own): PFK is a senior bond issued by Prudential that matures in 2018 at $25 and is currently selling at a premium to its par value. Prudential Financial Inflation linked Retail Medium Term Notes, PFK pays a monthly interest rate tied to a 2.4% spread over CPI. The CPI calculation for PFK is slightly different from the two exchange traded CPI floaters, OSM and ISM, that originate from SLM. PFK will use a fixed day count of 30/360, whereas the SLM floater will use day counts of 30/365 or 31/365 depending on the number of days in a monthly payment period. I show how the penny rate is calculated for OSM in item # 1 Added to OSM at 18.47. I will now show how the interest rate is calculated for PFK which has a higher spread and a different day count. All of these securities use the unadjusted CPI for All Urban Consumers. That data can be found at the stlouisfed. All of these securities will calculate CPI over a 12 month period, with a three month lag. 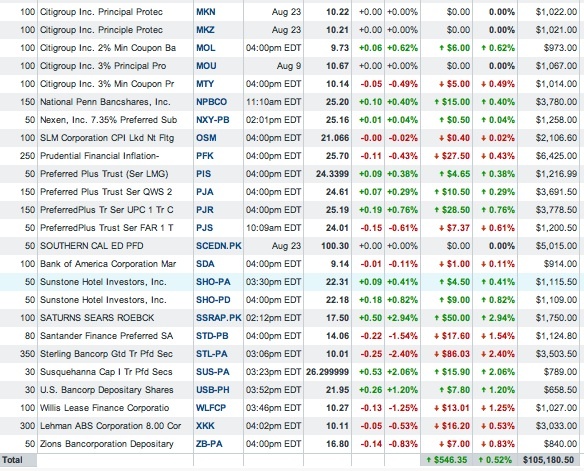 The WSJ dividend page shows that PFK will go ex interest on Tuesday, 8/30/11, and the payment date is 9/10/11. The penny rate for that September payment is shown at $.12437 per share. Bought 100 PFK at 18.47 (June 2009); Bought 90 PFK in IRA $18.94 (June 2009); Added 50 PFK at $17.83 (August 2009); Added 50 PFK in Roth at 20.88-Averaged UP (January 2010). Comparing Prudential Floating Rate Bonds Tied to CPI and Fixed Rate Coupon Bonds Maturing in 2018 (July 2009). The BAC TP's represent an interest in a bond owned by a trust issued by BAC or one of the companies acquired by it, and that bond would be senior in priority to all equity capital stock and junior in priority to all other bonds in the bank's capital structure. Reuters claims that buyers are not beating down the door to buy part of BAC's stake in China Construction Bank Corp (601939.SS). 1. Applied Materials (own): I have been trading this stock in small lots with the last lot bought at $12.45. Bought 50 AMAT at $12.45 (June 2011). After the bell yesterday, AMAT reported its fiscal third quarter results. SEC Filed Press Release. For that quarter, AMAT had net income of $476 million, or 36 cents per share on a GAAP basis, on revenues of $2.79 billion in revenues. The adjusted number was 35 cents. While that was better than the consensus estimate of 33 cents on $2.68 billion in sales, AMAT guided down for its fiscal 4th quarter to a 15-20% decline in sequential revenue and an E.P.S. in the range of 16 to 24 cents. The consensus 4th quarter estimate was for 31 or 33 cents depending on the service. The company lowered its outlook in response to the uncertainty in the global economy which has caused several customers to push out orders. The company also referred to "disappointing" PC sales during the back to school season. Orders from AMAT's foundry customers had softened "significantly" over the past six weeks. Sales in TVs have also been disappointing causing LCD panel manufacturers to delay new equipment orders until next year. As of 6/30/11, AMAT has $5.018 billion in cash/cash equivalents, short term investments of $739 million, and long term debt of $1.947 billion. AMAT is in the process of acquiring Varian Semiconductor Equipment (VSEA), which was recently approved by VSEA shareholders. I do not believe the Justice Department has cleared the merger yet under the Hart Scott Rodino Act. As noted in this Reuters' article, the downbeat forecast caused a number of firms to cut their price targets. Applied Materials fell 55 cents or 4.84% yesterday to close at $10.81. I may average down by rounding the lot up to 100 shares. The dividend yield is approaching 3%. 2. Bought 1 MetroPCS 7.875% Senior bond Maturing on 9/1/2018 at 98 last Wednesday (Junk Bond Ladder Strategy) (see Disclaimer): PCS is provides wireless broadband mobile services in several large metropolitan areas. Link to Reuters' Key Developments page. This is a link to the FINRA information on this bond: FINRA According to FINRA, it is rated B2 by Moody's and B by S & P.
Interest is paid on 3/1 and 9/1. My confirmation states that the current yield at my cost is 7.97% and the YTM is 8.102%. Some of the negatives are discussed in this Reuters article. The general thrust of that article is that KWK's capital expenditures are rising while the price of natural gas remains low. The current consensus forecast is for an E.P.S. of 21 cents in 2011 and 34 cents in 2012. KWK has been selling some assets. In October 2010, it sold its midstream assets, Quicksilver Gas Services, for $700 million. It has also been selling its interest in BreitBurn Energy Partners and still owns 8.6 million units as of 6/30/11 (page 14: e10vq). BBEP is a publicly traded company and is currently selling near $18 per share. The last earnings report beat the street consensus. KWK reported an E.P.S. of 7 cents, compared to a 5 cent consensus estimate, and estimated that third quarter production volume would be up 3% sequentially. 1. Is the market currently in a long term bear or bull market, generally lasting around 15 or so years? 2. What are the reasons for the market being in a long term bull or bear cycle? 3. For long term bear markets, have the underlying causes been remedied? And, if those causes are close to being remedied, what will likely power the next long term bull cycle? 4. Is the market in a cyclical bear or bull market? 5. And, what asset classes are positively correlated under current market conditions? What is the overall decree of correlation (strong, average or weak), and the main reason(s) for that correlation? For stocks, the end of a long term bull market is likely to coincide with excessive valuations. The start of a long term bull market would likely be marked by lower than normal valuations. Historical Shiller P/E10 Ratio for S&P 500 Peaks were reached, for example, in 1929, 1965-66 and 1999-2000. 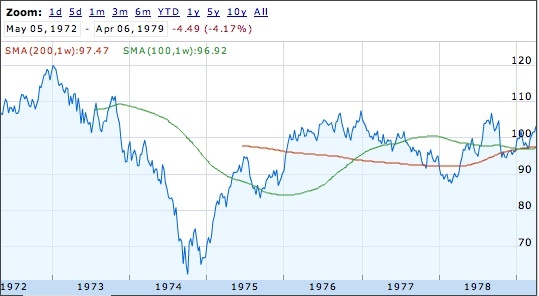 The 1982 long term bull market started with the Shiller P/E 10 below 10. The current P/E10 ratio is being influenced by two recessions occurring within the past ten years. In the blow out phase of the long term bull market, valuations become exceedingly irrational. The natural correction process is for the market averages to stagnate for about 15 years as earnings catch up. The market overreacts to the downside, pricing large companies with single digit or low double digit P/Es. Those are the most important issues for an investor to answer correctly. 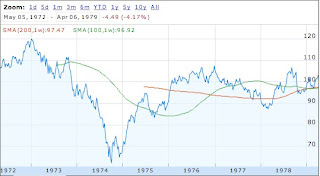 Looking back, it would not be difficult to determine that inflation was the primary economic reason underlying the longevity of the 1966 to August 1982 long term secular bear market. And, too much debt is the problem now. Spending borrowed money in rapidly increasing amounts provided fuel for the long term secular bull market that ended in October 1997 (or 2000 for everyone dating it other than me). Once that issue was identified as a potential source of future problems, the investor would be honed into that issue above virtually all others. For stocks, I believe that the market is currently in a cyclical bear market within the context of a long term bear market. I suspect that this long term bear cycle will last another two years. This is at best a guess about the future, subject to constant reevaluation. That belief, which may change based on new data, may lead me at some point to initiate some positions for long term holds, assuming I can see the light at the end of this long dark tunnel. I also acquired some long term positions, still held, during the catastrophic phase of the current long term bear market such as KO at $38.72. Those references to 1982 or 1974 are important. I am asking this question. Is the rally off the March 2009 low a typical snapback rally, similar to 1974 to 1976 or 1933 to 1937, or the start of a long term bull market. The last long term bull market started in 1982 whereas the run starting in 1974 was merely another short cyclical bull market within the context of an ongoing long term bear market. The answer to that question will dictate my trading pattern (buy and hold, or continue the hyper trading and constant allocation shifts appropriate for long term bear cycles). I have answered that question consistently since raising it and have responded in accordance with that opinion. For bonds, I believe that the market is currently in the final phase of a long term secular bull market which started also in 1982. For commodities, I believe that we are in the early stages of a long term bull market. 1. Bought 1 Penn Virginia Resources 8.25% Senior Bond Maturing on 4/15/2018 at 98 (Junk Bond Ladder Strategy)(See Disclaimer): Penn Virginia Resources is a publicly traded partnership that owns coal and natural resources and properties involved in natural gas processing, gathering and related services (midstream assets). Penn Virginia Resource Partners LP (PVR) This is a link to the last filed Form 10-Q and to the 2010 Penn Virginia Resource Partners, L.P. - Form 10-K. The long term debt is discussed in note 11 starting at page 90 of the Annual report. This is a link to the Prospectus: Penn Virginia Resource Partners, L.P. This is a link to the FINRA Information on this bond: FINRA According to FINRA, it is rated B2 by Moody's and B by S & P. My confirmation has the same ratings information. The confirmation states that the current yield at my cost is 8.35% and the YTM is 8.486%. I had to pay $30.02 in accrued interest to the seller. Since that post, VMC reported better than expected results for the 2011 second quarter. On an adjusted basis, the company reported net income of seven cents per share, compared to an expectation of a 5 cent per share loss. The company noted improved pricing in all business segments. SEC Filed Press Release EBITDA was $115.6 million for the quarter up from $97.3 million in the June 2010 quarter. As of 6/30/11, VMC had $106.744 million in cash and cash equivalents. Property, plant and equipment net of depreciation was shown at $3.543 billion. Inventories were at $329.265 million. Short term borrowings were reported at $100 million. Long term debt was high at $2.535 billion. A discussion of the debt can be found in note 11 starting at page 15 of the last filed SEC Form 10-Q: e10vq The company was able to sell $1.1 billion in notes last June. Five hundred million was raised at 6.5%, maturing in 2016, and another $600 million at 7.5% maturing in 2021. The confirmation states that the current yield is 7.268% and the YTM is 7.706%. This bond is rated Ba 1 by Moody's and BB by S & P.
Both of the junk bonds bought last Tuesday are of higher quality than the average bond in my junk bond ladder strategy. These two bonds are viewed as the substitutes for 100 shares of the lower yielding bond CEF BDF sold on Tuesday. I am attempting to increase my cash flow without dipping much into my cash stash raised primarily from a significant reduction in my stock allocation. I am rating both of these bonds at "6" in my Personal Risk Ratings For Junk Bonds. This article in the WSJ, titled "Rush Out of Junk", summarizes what has been happening in the risky junk bond market over the past few weeks. Returns in August from the Barclays Capital U.S. HIgh Yield Index has fallen to a negative 5.1%, the worst performance since November 2008. Selling appears to be widespread. The yield spread in the Barclay's High Yield Index over treasuries has expanded to 7.66%, the highest level since November 2009. In the event the U.S. falls into a recession, junk bonds will continue to underperform investment grades bonds with similar maturities. I would expect them to outperform the investment grade corporates when it becomes evident that the economy is once again picking up a good head of steam. When I own a bond, I would not ask anyone why it is going down or up. I would make that judgment for myself. An investor really has to do that kind of assessment for themselves. I may have an opinion, but another investor looking at the same facts could disagree with me and be right. Both started to rise in tandem in March 2009, both fell a lot during the Dark Period, and both asset classes have declined recently based on the same recession concerns. Those concerns raise legitimate issues about the credit risk of junk bonds. In addition, junk bond mutual funds are experiencing redemptions which causes even more selling. Some junk bonds will lose more than the average based on quarterly results and/or other news such as a downgrade in credit ratings. Earnings releases for private companies who have registered their bonds can be found at the SEC website: Company Search. There is no excuse other than laziness for refusing to review filings at the SEC. For example, the Colt Defense bond has lost value and it is not difficult to ascertain why by simply reviewing the earnings report. The company is losing money and eating up its cash, as inventories swell. Form 10-Q for Q/E 6/2011 This is not brain surgery. I own just one bond and stated earlier that I would buy no more after reviewing the 2011 first quarter report which presaged the second quarter. An article written by Peter Fisher, head of Blackrock's fixed income group, points out that volatility and low rates makes the world a riskier place for investors. Morningstar. The abnormally low rates force investors into riskier assets which are becoming more volatile for a variety of reasons. The risk of principal loss is significant. If a 1% to 2% yield on savings is inadequate to fund expenses for a retiree, then there is a risk going with that option. That risk has to be compared with the risk inherent now in reaching for a more satisfactory yield. It is a difficult balance to reach given the length of the Federal Reserve's Jihad against the Saving Class, likely to continue for at least two more years. One way to deal with these two undesirable choices is to keep savings tilted toward preservation of capital and to cut discretionary spending, obviating at least to some degree the need to earn more on savings. For the OG, that would mean moving from the normal spendthrift frugal mode to the extreme you have got to be kidding frugal mode (i.e. no renewals of magazine subscriptions, temperature set two degrees higher at HQ, coasting down all hills with the Saturn, no new clothes purchases unless a pair of socks has a hole the size of a fist; cutting down on snack foods including hershey kisses; no more popcorn; washing clothes and dishes only with full loads; and no new book purchases-just read what has not been read in the large HQ library) And that is not because I have to do it. The treasury sold 35 billion in two year notes yesterday at a yield of .222%, a record low. Historical treasury bond, note and bill yields can be downloaded from the Federal Reserve's website: FRB: H.15 Release--Selected Interest Rates--Historical Data In September 1981, the two year note hit a 16.46% yield. Between October 2005 to October 2007, it fluctuated mostly in a 4% to 5% range. As noted by Kurt Andersen in his NYT opinion column, true believers like Rick Perry and Michele Bachmann really do believe in their reality creations. I previously referenced an article in the WSJ about Perry's version of crony capitalism, where state grants, contracts and tax favors appear to be dependent on donors making large contributions to his campaigns. A similar article with more detail can be found in Sunday's NYT. Many of the TBs would look with disfavor on such news items but are unlikely to ever come into contact with accurate information. So Perry is in no danger of having his record examined by TBs with reliable information in tow. I do believe that low tax states like Texas and Tennessee have an advantage, particularly now, compared to high tax states like Illinois, California, New York, Massachusetts and New Jersey. Several firms have relocated to my region from those high tax states, which also have higher costs in most living expenses. 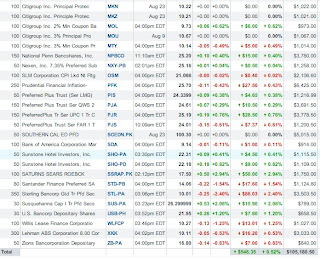 During downturns in the stock market, no matter how severe, I will continue to use cash flow to buy common stocks. This will in effect mean small purchases spaced out over time. While I receive a constant flow of interest and dividend payments, most of the distributions are paid at or near the end of the month or on the 15 day of a month, with the highest amounts paid at the end of each calender quarter. This strategy, which is my most basic one, places a premium on reliable cash flow. The stream of income from senior bonds is more reliable than common stock dividends as shown by events during the recent Near Depression period. In 2009, more than 800 firms reduced or eliminated their dividends. That is not an option for the issuer of a senior bond, short of bankruptcy. In the common stock universe, I would not regard any bank dividend as safe. Dividends from consumer staple companies are generally more reliable, and I will be interested in buying their stocks during serious stock downturns. Dividend paying companies are not immune to stock downdrafts. I will do most of my buying of consumer staple stocks during major cyclical bear markets. While I do not expect that PG or PEP will fall below $50, an entry level point for the catastrophic phase of the current long term bear market occurring between September 2008 to March 2009, I would look to buy shares at below $55, possibly starting a position at below $58. Bought PG at $47.59 (March 2009 Post); Pepsico Buy (May 2009). The government reported that new home sales for July fell to a very anemic seasonally adjusted annual rate of 298,000. census.gov.pdf The competition for homebuilders is coming from foreclosed homes that make up about 33% of existing home sales. In short, new home construction is in a major rut and not likely to climb out of it for a long time and consequently will not be providing any impetus to job creation or GDP growth. The market may have rallied yesterday based on the hope that the Fed will ride to the rescue, again, as maintained by the news headlines. WSJ Maybe so, but that is a false hope. There is no magic left in the Fed's bag of magic tricks that would change the course of the economy for the better. Something could be done in Washington to keep the nation from sliding into another recession, but that is highly unlikely to happen. 1. Sold 100 BDF at $18.85 Yesterday (see Disclaimer): This bond CEF was bought in two lots last November. Bought 50 BDF @ 17.73 Bought 100 BDF @ 18.46 (previously sold 50 of this 100 lot using FIFO accounting) So, I collected a few quarterly dividends and made a profit on the shares. I am content with that result. I bought two higher yielding junk bonds to replace BDF which I will discuss in the next post. V. N. Katsenelson wrote a spot on critique of HP's CEO and Board in his MSN Money column. Given the obvious idiocy and incompetence of HPQ's CEO and Board, the only way out for existing shareholders is for HPQ to be acquired, possibly in a joint bid by Oracle and private equity firms interested in different parts of Hewlett. That prospect, which may be HPQ's shareholders only viable option now to recover some of the destroyed share value, is discussed in this Bloomberg article. HPQ's share price has fallen 42% since Leo Apotheker became CEO. Goldman Sachs Group (GS) fell $5.25 to close at $106.51 yesterday, hitting a new 52 week low of $105.1 intraday. There was a report that Goldman's CEO and other executives have lawyered up. Reuters CNBC.com Credit defaults on GS debt increased in price. Bloomberg I previously mentioned the headline risk as one reason for keeping my exposure to GS bonds small. Item # 4 Cash Allocation At Highest Level Since Spring of 2009 (5/23/2011 Post); Item # 3 Sold 100 GYB at 19.7 in Roth IRA-Reducing Exposure to GS Bonds to Zero (May 24 2011 Post). I currently own only 50 GYB, 50 GJS and 50 GSPRA, all recently bought after corrections in price reduced some of the concerns about the headline risk. Buffett pointed out in an opinion column last week (NYT) that his tax rate was lower than anyone else working in his office including his secretary. Scott Black is telling individual investors to stay out of this market. The risk premium to holding equities is "way high now". He appears to be more than a bit flustered with both the Democrats and Republicans. Money video I would agree with those sentiments, except individual investors with deep pockets and/or a zen like approach to volatility may start to dip their toes back into selective names. Part of my rationale for that suggestion is my belief the current long term bear market is relatively close to an end, possibly another two or three years, and it will be impossible to time with any precision the onset of the next long term bull market. The market is not being irrational now. The recession fears are legitimate. If one develops, there is no way to know how deep it will be and fear of the unknown will in itself cause more selling. This is a statement that I made in a post from 6/13/2011: "The OG says things are getting worse not better, and there are a number of possible, even probable scenarios, that could send the stock markets around the world into another major cyclical bear market. The OG believes that one more significant cyclical bear cycle is in the offing, and that short term down move will take the S & P 500 to below 1000 by 2013... The OG wants to keep the stock allocation modest through 2012... The OG is filled with anxiety about what may soon happen". Stocks & Politics This was in the context of a debate among staff members here at HQ, ultimately won by the OG as the stock allocation was slashed further through the end of July. One way to deal with the re-entry conundrum is to do some mechanical trading. 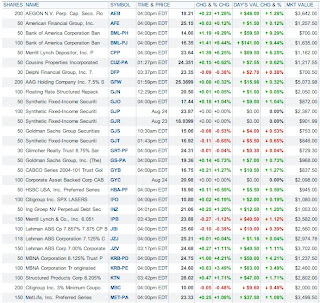 For example, I sold 103 shares of the stock ETF OEF on July 25th at $59.98, having bought those shares at $49.11. I am okay with holding this kind of security long term, even though I have now bought and sold it twice. OEF closed at $51.10 yesterday, so I would clearly be ahead by just buying those shares back now. Instead of doing that however, I could set up a mechanical trade to buy 50 shares soon and another 50 on a dip below $50, trying to reproduce my $49.11 share price from the previous round trip. Another transaction was a 100 share buy at $49.61 (June 2010), sold more quickly at $54.94 (December 2010). Total Realized Gains OEF December 2010 to July 25, 2011= $1,613.12. Rallies are being sold. Risk is being sold. Uncertainty prevails. The ^VIX closed at 42.44 yesterday, indicating a heightened level of fear and volatility. I continue to expect more volatility with large moves up and down with an overall downside bias. I would not expect any productive action from the Congress either. The problems are not hard to see. There is a short to intermediate term demand problem and a long term fiscal problem for the government. The way to address those problems would be to launch a massive infrastructure build over the next five to seven years coupled with a viable plan to reduce other federal spending over the long term (incrementally over 40 years), including spending on entitlements, plus some tax increases and the closing of tax loopholes.. The infrastructure spending needs to be done anyway, and now is probably the best time to do it with interest rates at historic lows and the need so glaringly apparent. None of the foregoing is going to happen. Both political tribes are incompetent and negligent. Due to my view on the macro issues, I did not have any trades yesterday. 1. Sold 100 of the BMO MID CORPORATE BOND INDEX ETF (ZCM:CA) at 15.85 CADs Last Week (see Disclaimer): This ETF, bought on the Toronto exchange, was sold for a small $49.18 profit, according to my broker. Bought:100 ZCM:CA @ 15.3 CAD (the broker calculates profit by converting both the purchase cost and the sales price from CADs into USDs) This ETF owns intermediate term Canadian corporate bonds. My intent is to use the proceeds to buy more of the CLAYMORE 1-5 Year Laddered Canadian Government Bond ETF (CLF:CA). The yields are about the same and I am more comfortable with the government bonds. Canadian Dollar (CAD) Strategy I currently own 400 shares of CLF:CA. BOUGHT 200 CLF:TO AT 20.20 CAD Added 100 CLF:TO-Sold 100 CPD:TO Sold HSE:TO at 30.48 CAD/Bought 100 of ETF CLF:TO at 20.10 CAD Both ZCM:CA and CLF:CA pay dividends monthly in Canadian currency after the 15% Canadian withholding tax. BMO Mid Corporate Bond Index ETF closed at 15.83 CADs on the Toronto exchange yesterday. 2. Averaged Down: Bought 40 VLY at $10.58, 50 TRST at $4.01 and 30 FMER at $11.35 Last Friday (Regional Bank Stocks' basket strategy)(see Disclaimer): I added to my positions in Valley National (VLY), Trustco (TRST) and First Merit (FMER) last Friday. The position in VLY is now 250 shares, 370+ in TRST, and 131+ in FMER. I am taking the VLY dividends in cash and reinvesting FMER's and TRST's dividends to buy additional shares. 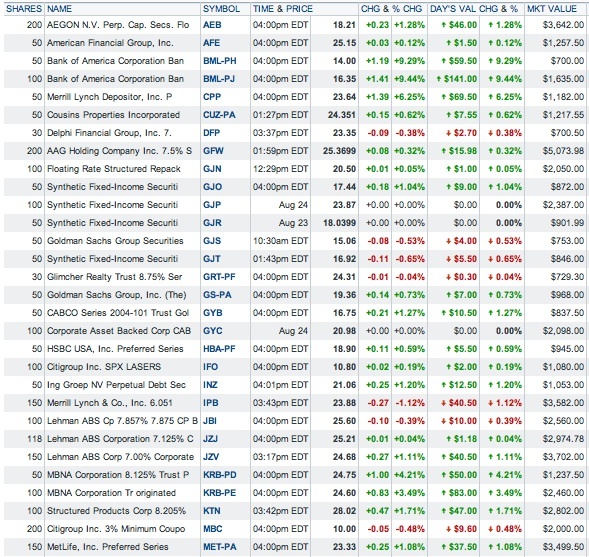 All of these stocks have been hammered over the past few weeks. If they can continue paying their dividends, then I would expect to come out ahead over the long term, meaning five to ten years. This is a link to the last filed SEC Form 10-Q for VLY. The bank earned 22 cents for the Q/E 6/2011, up from 20 cents in the year earlier quarter. As of 6/30/11, NPLs to total loans was at 1.19%; the allowance for loan losses as a percent of non-accruals was at 105.41; the total risk-based capital ratio was 13.1% at the holding company and 12.5% at the bank; and the net interest margin was at 3.67%. Valley National Bancorp closed at $10.61 yesterday, up six cents. I discussed First Merit's last earnings report at Item # 1 FMER. The current quarterly dividend is 16 cents per share: FirstMerit Corporation Announces Quarterly Cash Dividend of $0.16 Per Share At a total cost of $11.35, the yield at that rate is about 5.64%. While it is impossible to know when the market will cease shellacking regional banks, the dividend yield will provide support in the current low rate environment provided there are no reductions. The market seems to have taken these stocks to the woodshed by assuming that all kinds of bad events will certainly happen, including dividend cuts, before there is any concrete reasons to support such a forecast. I believe their current prices already reflect a mild recession, some acceleration of problem loans and some additional compression in the net interest margin. FirstMerit Corp. closed at $11.43 yesterday, up seven cents. The current dividend yield on Trustco shares, bought at a total cost of $4.01, is around 6.54%, which is the main reason for adding shares. The current quarterly rate is $.0656, with the next ex dividend date on 8/31/2011. MarketWatch The $4 share price was last seen in 1994-1995 time period. I discussed the last earnings report in Item # 2 TRST. Trustco Bank Corp. closed at $3.98 yesterday. Stifel Nicholaus upgraded TRST yesterday to Buy from Hold with a $5.5 price target. The purchases discussed in this section are what I call shotgun scatter buys, a fairly typical buying pattern when I view that there are significant potential downside risks, while recognizing that I may be wrong about the macro view. When the macro view is negative, the compromise is to keep buying, but only in small and insignificant amounts for me, and to scatter those buys, both in terms of time, number and variety of securities. I will generally buy only on down days when in this trading pattern unless the securities being bought are down in value during that up day. Anything bought may have to be held for months or even years. My investment approach is very much driven by my big picture, macro views.